Do you have any fun Halloween plans? We have a work party tomorrow night in Seattle. Normally I go all out on a costume, but this year I’m throwing on a flannel and overalls, turning into a scarecrow and calling it a day! I want to be festive but there’s nothing worse than an uncomfortable costume. The rest of the weekend I plan on watching scary movies, breaking into the mini KitKats and pumpkin shaped Reeses and having a cozy weekend at home. 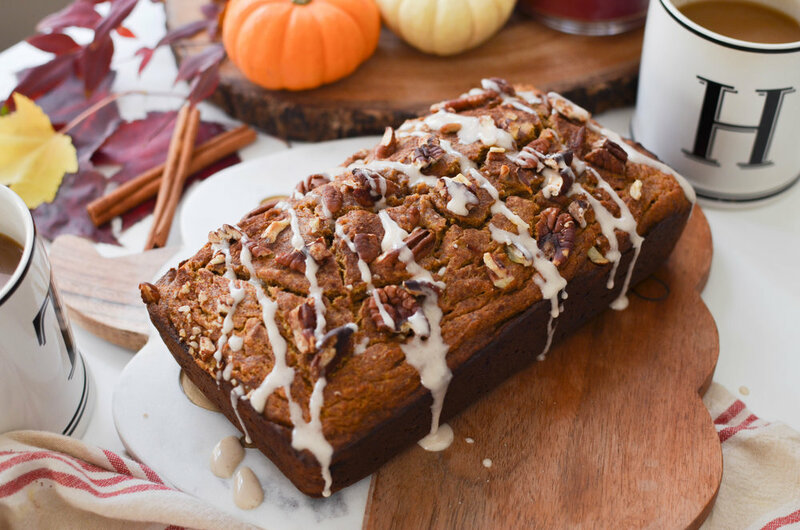 Last weekend I baked this pumpkin banana bread and it is so perfect for Fall. Not too sweet for breakfast and is great with a cup of coffee in the afternoon. We always have bananas lying around, so this bread is even better when you have a couple of really ripe ones. I adapted this recipe from Cookie & Kate. I love her pumpkin bread, I just tweaked it by adding bananas and adjusted the measurements a little. I hope you all have a great weekend, filled with all the pumpkin-y things, scary movies, haunted houses, costume parties, and copious amounts of candy! Add the pumpkin purée, mashed bananas, milk, pumpkin spice, baking soda, vanilla and salt, and whisk to blend. Lastly, switch to a big spoon and stir in the flour, just until combined. Some lumps are ok! If you’re adding any additional mix-ins, gently fold them in now. Bake for 55 to 60 minutes, or until a toothpick inserted into the center comes out clean (typically, if I haven’t added any mix-ins, my bread is done at 55 minutes; if I have added mix-ins, it needs closer to 60 minutes). Let the bread cool in the loaf pan for 10 minutes, then carefully transfer the bread to a cooling rack to cool for 20 minutes before slicing.